The town of Campi Salentina in the province of Lecce opens its courtyards, streets, piazzas and its heart to visitors and locals alike on two days in October. 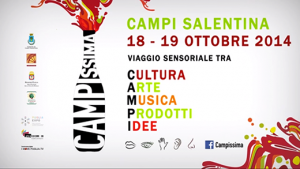 Campi’s name has been turned into an acronym to demonstrate what the event is all about – a heady mix of Culture, Art, Music, Products and Ideas. The event, which has been organised by the Puglia trade fair society in conjunction with Puglia Expo, the Apulia Film Commission and Imove Puglia.TV, coincides with the religious and civil celebration of Madonna della Mercede. There will be a series of eventi cultural-enogastronomici which means that food and wine from the region will play a very big part in the festivities! The local authorities and organizers believe that a city that does not develop and move with the times will stagnate. They also say that a chance encounter or a new experience can change your life. That is why they want visitors to be surprised and delighted by what they might find around the next corner as they enjoy the beauty of this lovely city, enhanced by music, street theatre and the opportunity to taste wonderful local produce.